Maintaining the cleanliness of a commercial property is essential. An environment with dirty carpets or a dingy smell leaves a poor impression especially with clients and visitors. Maintaining clean spaces can be a time consuming task but is highly beneficial for a more productive environment. Hiring the services of a cleaning company allows you to maintain a clean environment without the hassles. If you are looking for reliable commercial cleaners in Perth, we can help. Contract Cleaning Management offers comprehensive cleaning services for commercial properties. Our services are backed by extensive industry experience which allows us to maintain a consistent level of quality. We handle all your specific requirements so you can focus on more important matters. We are committed to delivering exceptional services at competitive rates. With flexible cleaning packages available, our services are tailored to your needs. Whether you need us for daily or monthly cleaning, we can accommodate your needs with minimal disruption to your organisation. Contact us today to request a quote for our services or browse our testimonials. No two businesses have the same cleaning requirements. Which is why our services are tailored to meet your needs without any compromises on quality. Carpet cleaning: Dirty carpets are an indication of a poorly maintained environment. Using powerful equipment, we deliver a deep clean to your carpets without causing any damage. Weekly and monthly scheduled cleaning are available. Window cleaning: Dirty windows can make any property look unappealing. Our professionals handle the arduous task of keeping your windows clean. So you won’t have to worry about leaving visitors with a poor impression. Office maintenance: A well kept environment is an important aspect for all businesses. We offer assistance with minor repairs and electrical problems that may disrupt productivity. Keeping any commercial property clean is a time consuming effort. Whether you need weekly or monthly cleaning, we offer customised solutions that are tailored for your business. Flexibility: Customised packages are available to meet your needs and budget. Our cleaners work according to your schedule whether you need us weekly or monthly. Fully insured: Safety and security are just as important as the services we provide. Our staff have full insurance coverage and each member has also been cleared by the federal police. Customer satisfaction: Our clients are our top priority. When you work with our team, we make every effort to ensure you are completely satisfied with our services. 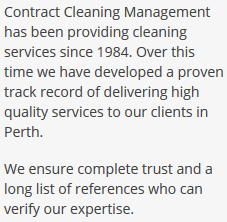 Contract Cleaning Management delivers specialised services that are specific to your business. We handle all your cleaning and keep your property in excellent condition. Prices are kept competitive when you work with our team. Call us today on 0439 963 576 for a reliable commercial cleaner in Perth or use our online form to send us an enquiry.